Our Official Full Launch at MathsFest / IMTA Conference! Home / Business / Our Official Full Launch at MathsFest / IMTA Conference! 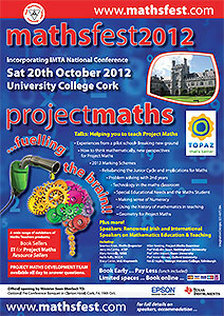 We are very excited about our official Full Launch at MathsFest 2012 in Cork on Sat 20th October. We’ve made a lot of improvements and added a lot of new content to the system since our ‘soft launch’ earlier in the year. Now we are ready to open up the system to everyone! MathsFest is the perfect event for our launch, as it is Ireland’s largest Maths education show, and it also incorporates the conference of the Irish Maths Teachers Association. There are going to be over 500 maths teachers attending, and we are looking forward to meeting them at our stand. As part of our celebrations, we are having a nice giveaway on the day – there are 3 of these Kensington Presenters up for grabs! Brilliant for the hi-tech teacher!